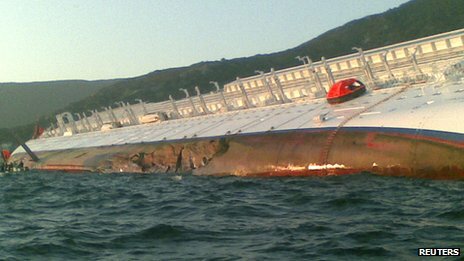 "The coast guard official, speaking from the port captain's office in the Tuscan port of Livorno, said the vessel "hit an obstacle" — it wasn't clear if it might have hit a rocky reef in the waters off Giglio — "ripping a gash 50 meters (165 feet) across" on the left side of the ship, and started taking on water. The cruise liner's captain, Paolillo said, then tried to steer his ship toward shallow waters, near Giglio's small port, to make evacuation by lifeboat easier. But after the ship started listing badly onto its right side, lifeboat evacuation was no longer feasible, Paolillo said." 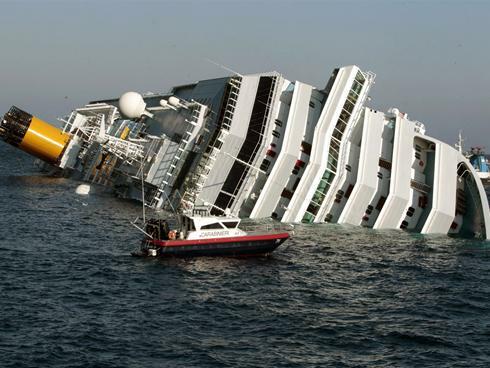 "The ship was three-quarters under water and sinking fast"
"The ship was three-quarters under water and sinking fast, a Giglio hotel clerk told NBC News." "Passengers complained that the evacuation was delayed and disorganised, exacerbating the panic on board. Some complained that the crew failed to give instructions on how to evacuate the ship, with a drill only scheduled for Saturday afternoon. "It was so unorganised. Our evacuation drill was scheduled for 5pm," said Melissa Goduti, 28, of Wallingford, Connecticut, in the US. "We had joked what if something had happened today [Friday]." 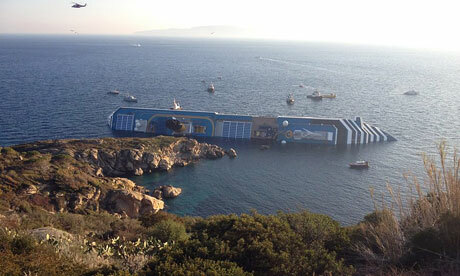 Passenger Mara Parmegiani told the Italian news agency Ansa that "it was like a scene from the Titanic". Survivor Christine Hammer, from Bonn, Germany, said she was eating her first course when the ship ran aground. "We heard a crash. Glasses and plates fell down and we went out of the dining room and we were told it wasn't anything dangerous," she said. The passengers were then instructed to put on lifejackets and take to the lifeboats. But Hammer, who was travelling with her husband, Gert, on her first ever cruise trip, said people could not get into the lifeboats because the liner was listing so badly that they could not be lowered into the sea." "No one counted us, neither in the life boats or on land," said Ophelie Gondelle, 28, a French military officer from Marseille. She said there had been no evacuation drill since she boarded in France on Jan. 8. As dawn neared, a painstaking search of the 290-meter (950-foot) long ship's interior was being conducted to see if anyone might have been trapped inside, Paolillo said. "There are some 2,000 cabins, and the ship isn't straight," Paolillo said, referring to the Concordia's dramatic more than 45-degree tilt on its right side. "I'll leave it to your imagination to understand how they (the rescuers) are working as they move through it." He said: "We just saw a huge rock, that was probably where the ship hit, and people were having huge trouble trying to get on the lifeboats. So at that point we didn't know what to do so it took hours for people to get off the ship. Mr Costa added that the rescue operation was continuing with people still in the sea." 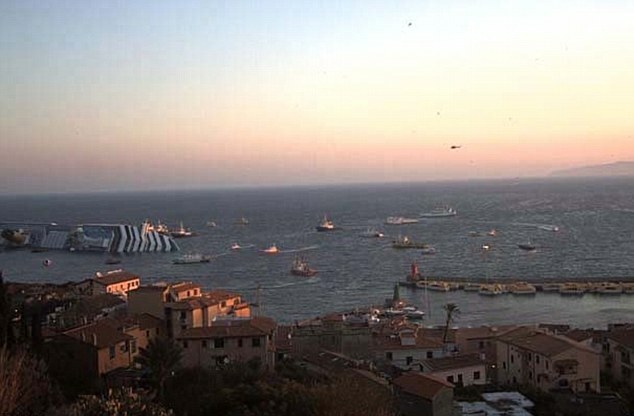 "at this stage it's impossible to determine exactly what happened"
"There will certainly be an investigation but at this stage it's impossible to determine exactly what happened," said Italo Spalvieri of the Guardia di Finanze in the nearby port of Livorno." "Micky Arison @MickyArison Micky Arison Tonight our thoughts and prayers are with the passengers and crew of the CostaConcordia." 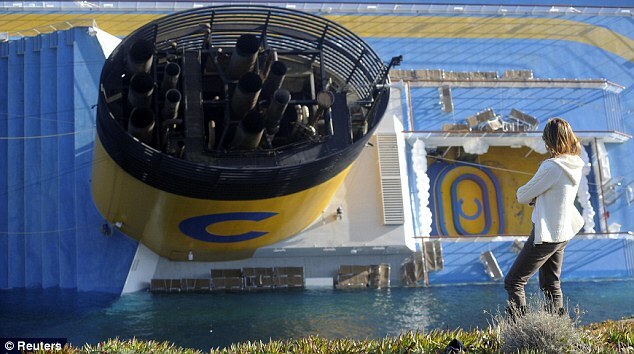 "Specialist diving teams are being brought in to search the interior of the cruise ship Costa Concordia after it ran aground off the Italian coast, fire services spokesman Luca Cari says." "We heard a crash. Glasses and plates fell down and we went out of the dining room and we were told it wasn't anything dangerous." 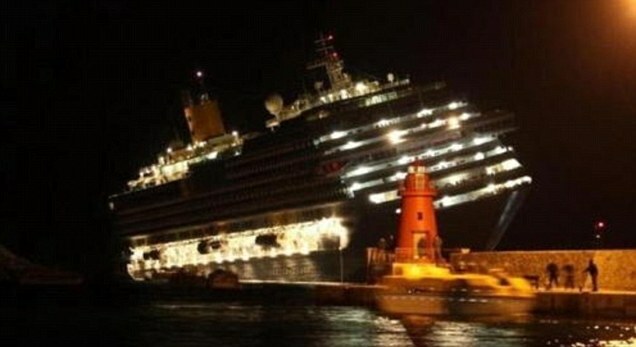 "Italian prosecutors have detained the captain of the cruise ship that ran aground off Tuscany as three people are confirmed dead and local officials report that 69 people are still unaccounted for. 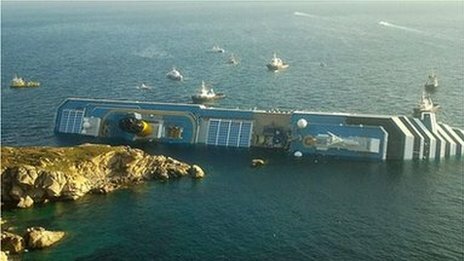 Earlier Saturday Francesco Schettino, captain of the Costa Concordia, had told Italian television that the vessel had hit a rocky spur while cruising in waters which, according to the charts, should have been safe. "According to the nautical chart, there should have been sufficient water underneath us," he added." 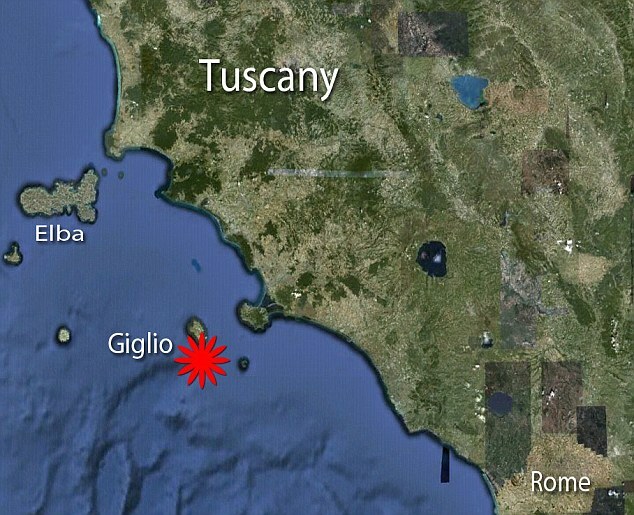 "Authorities were looking at why the ship didn't hail a mayday during the accident near the Italian island of Giglio on Friday night, officials said. 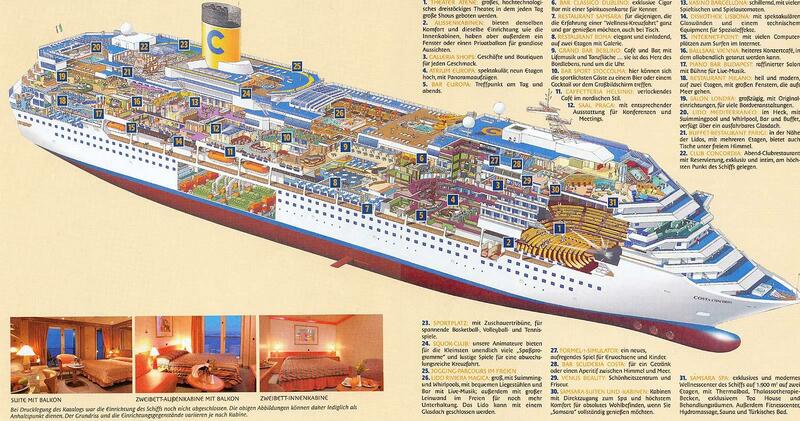 The ship is owned by Genoa-based Costa Cruises. "At the moment we can't exclude that the ship had some kind of technical problem, and for this reason moved towards the coast in order to save the passengers, the crew and the ship. But they didn't send a mayday. The ship got in contact with us once the evacuation procedures were already ongoing," Del Santo said prior to the announcement of the arrest. 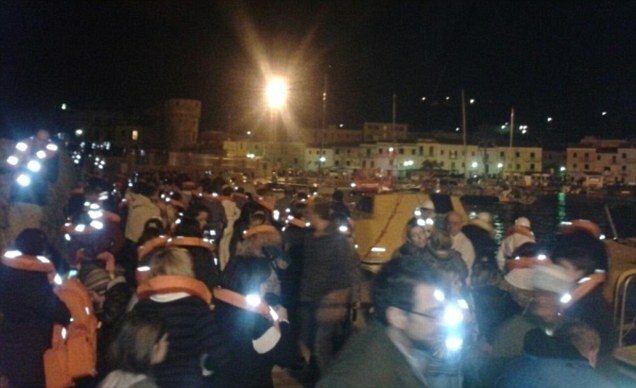 Giuseppe Orsina, a spokesman with the local civil protection agency, said 43 to 51 people were missing, though authorities are reviewing passenger lists to confirm the exact figure. 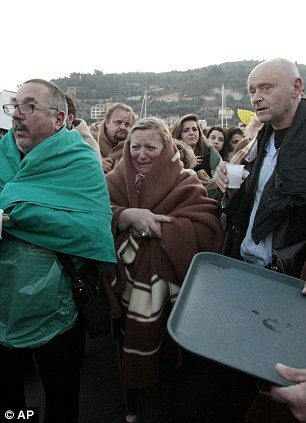 "These people could be still on the island of Giglio, in private houses or in hospitals," Orsina said. The coast guard said 50 to 70 people could be missing. The ship was 2.5 miles off route when it struck a rocky sandbar, according to the Italian Coast Guard. Local fishermen say the island coast of Giglio is known for its rocky sea floor. 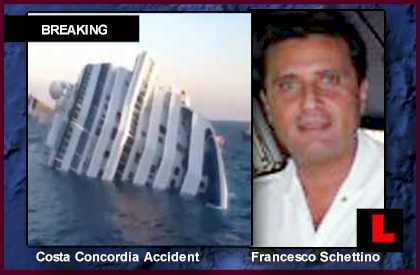 "Captain Schettino, who was on the bridge at the time, immediately understood the severity of the situation and performed a maneuver intended to protect both guests and crew, and initiated security procedures to prepare for an eventual ship evacuation," he continued. "Unfortunately, that operation was complicated by a sudden tilting of the ship that made disembarkation difficult," Onorato said. 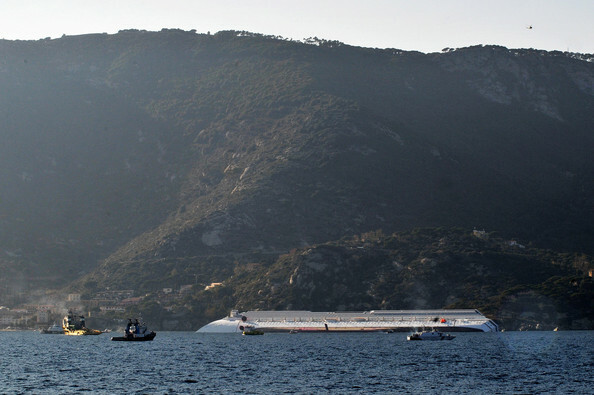 Some passengers fell into the chilly waters during the rescue, Italy's ANSA news agency reported. "Cruise operator Costa Crociere said in a statement: "Emergency procedures have been promptly activated, our crew members on board are professionally trained and they took all the necessary actions to assist our guests and help them to evacuate the ship." But the sailors' union Nautilus International said that, 100 years on from the sinking of the Titanic, "many ships are now effectively small towns at sea, and the sheer number of people on board raises serious questions about evacuation".